Grip the euphoria and speed of skating style skiing with real wooden composite construction ski frames. 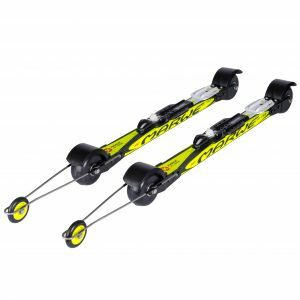 These skis offer the best possible skiing feeling combined with properties which will make you almost forget the lack of snow. Get introduced to roller skiing nice and easy. The 590XC skis are ideal for beginners who want to learn skating style roller skiing and maximise their effort right from the beginning. 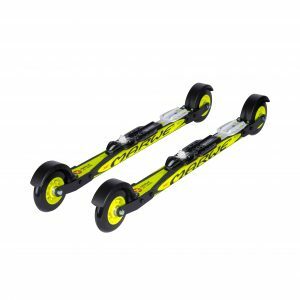 The skis wider wheels provide good vibration properties and sense of balance and the composite wooden frame offers enjoyable snow feel characteristics. The 620XC is one of our most popular wood composite roller skis – and for an reason. The composite frame of the ski offers properties that makes it the ideal companion for endurance training. Superior vibration damping properties ensure that skiing with them is less tiresome, thus enabing the athlete to make longer and of course faster roller skiing sessions. The all-rounder skate roller ski seen at skiing tracks and training sessions around the world. When going roller skiing to places you have never been before, the 620XC is the perfect choice.